American Silver Eagle bullion coins are off to a stellar start in 2011, registering monthly sales never before seen in the history of the program. 6,422,000 of the .999 fine silver coins were ordered by authorized dealers during January 2011, according to United States Mint sales figures. Not only did the monthly sales attain the new record, the old one was shattered by a margin of 2.162 million coins. The previous monthly record was established in November 2010 when 4,260,000 Silver Eagles were sold. Calculated out, the new record represents an improvement of over 50%. News of the achievement is not surprising. Weekly figures issued by the US Mint already had sales reaching the top spot by January 19. What was not known at that time, however, was the extent by which the old record would be thrashed. Since mid-2008, buyers have been ordering American Silver Eagles in mostly never-before-seen quantities. This led to difficulties for the US Mint as it was required by law to produce them to meet demand. The Mint was unable to acquire a sufficient supply of blank planchets so it was forced to ration the bullion coins. Unprecedented demand also led to the cancellation of the collector 2009 Proof Silver Eagle as the Mint used all of its available resources towards bullion production. Finally, with a tripling of available planchets from its suppliers, the US Mint was able to increase production. As shown by the chart above, 2010 was an excellent year for the bullion coins. Seven of the top ten best months were linked to the year. These made 2010 a record holder itself, attaining the new annual #1 spot with 34,662,500 coins sold. Obviously, if the trend established by January 2011 continues, that record would fall quickly. Bullion American Silver Eagles are sold by the US Mint through its network of authorized purchasers. These purchasers obtain the strikes in large quantities, then resell them in smaller lots to coin dealers and individuals for a small premium above the current spot price of the silver contained within them. In this way, investors are able to add small amounts of the precious metal to their portfolios at near-market prices. The Silver Eagle is not the only silver bullion series from the Mint. America the Beautiful Silver Bullion Coins were introduced late last year. This new 12-year series features 5-ounce, 3-inch diameter coins that bear the same designs as the circulating America the Beautiful Quarters®. Limited production of the coins has led to sizeable issues in their distribution and availability. Collector versions of America the Beautiful Silver Bullion Coins are yet to be released. Like the 2011 American Silver Eagle uncirculated coin, the US Mint has a release date for each of them on its silver product schedule listed as "TBD," or To Be Determined. 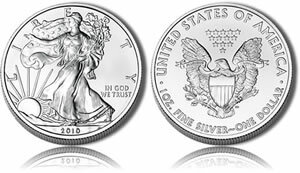 The collector 2011 American Silver Eagle proof coin is expected to be issued by July 6. Interesting news indeed. Did you know that January’s numbers exceed the average yearly production numbers for Eagles during the first 15 years of the program? And going back for the last 10 years, January’s numbers are half the yearly production number for that time frame. I guess the question is, have we peaked yet or is their still room to grow? All I know is that owning physical Silver is a great way to protect yourself from the falling value of the dollar. This is very interesting. I think that the American Silver Eagle bullion coins will continue to rise with unprecedented demand for some time to come. The new sales record by 50% is a massive increase.